Friends and family know that I have a passion for sake. Hence they were not surprised when I enrolled in sake courses, but they were all amazed at what I have created after completing the WSET Level 3 Award in Sake. It’s SAKE CHOCOLATES, my own invention!! I actually came up with an idea of using sake in chocolate when I was taking the Level 3 sake course. There are many liquor filled chocolates in the North American market, whereas sake chocolates are not the sweets you can easily find in a chocolate shop. 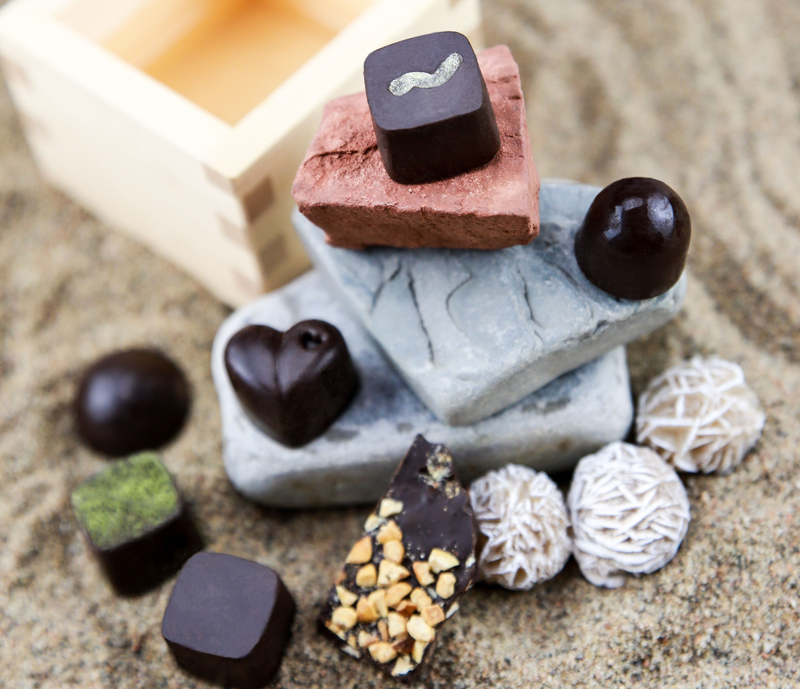 Therefore, I decided to establish Canada’s first chocolate company specializing in making Sake Chocolates. Soon after I had this in mind, I began my research and interviewed with pastry chefs. Later I successfully created new recipes for my sake chocolates. I used Sake to make the irresistibly smooth ganache, which was then infused in the delicate 70% cocoa dark chocolate shell. When eaten, the shell crunched, and the sake ganache melted in the mouth. The alcohol taste slowly released from the ganache and you should be able to feel it at the tip of the throat; then the taste gradually penetrated to fulfill every inch in the palate. The strong alcohol taste certainly complemented with the bittersweet flavours in dark chocolate, and helped make the sake chocolate very well balanced. Sweet fruits and dark chocolate are always good partners. For this reason, I mixed dried apricot pieces into the sake ganache while making the heart-shaped sake chocolate. The dried apricot pieces were not ordinary dried fruit; in fact they were soaked in sake for a few days in the beginning of the preparation process. When it’s ready for making sake chocolates, I dried it in oven. The sugar contained in the apricot became condensed, and the bold sweet fruit flavour was later neutralized by the bitterness in dark chocolate. When you eat this lovely chocolate heart, you would be surprised by how well the dried apricot pieces could optimize the sake and dark chocolate flavour combinations. Moreover, I created a new recipe to make “Sake Jello” too! Named “Sake Jello”, the soft jelly candy was actually made with sake, and it was nicely enveloped in a dome-shaped dark chocolate shell. When the “Sake Jello” melted in the mouth, you would taste a subtle alcohol flavour from the sake, plus a hint of coconut taste from the ingredients too. Besides the above mentioned three varieties of sake chocolates, I also developed sake-kasu chocolates. Sake-kasu is the solid cake left over from the filtration process during sake production. Japanese people use sake-kasu in everyday cooking to make soups, pickles, marinades for fish, and many more. I use locally produced fresh sake-kasu to make sake-kasu chocolates, and there are three different flavours, including “Matcha”, “Soy Milk”, and “Chocolate Mousse”. All are low in alcohol, 8% or less. For those who appreciate creative flavour design, sake-kasu chocolates are simply the chocolates to satisfy your taste buds.